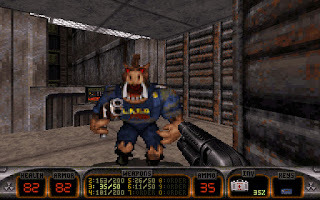 If Doom introduced the idea of realistic environments that still retained elements of strong gameplay, Duke Nukem 3D took it to perfection. 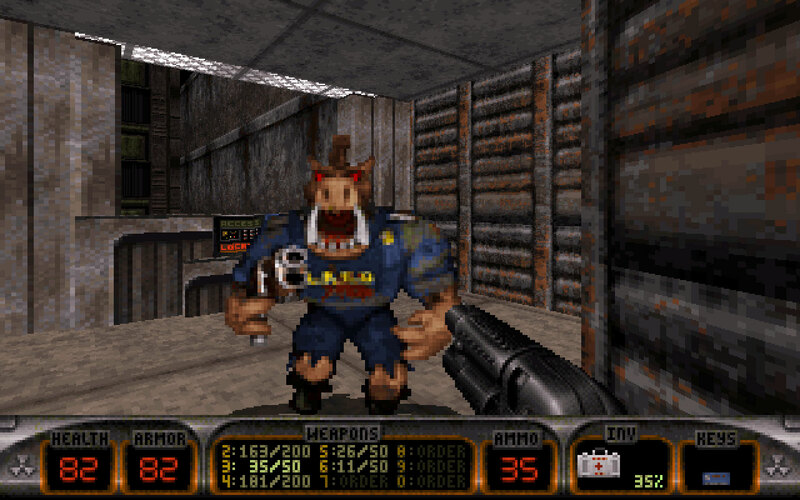 Not content to take place in sterile military bases and stone buildings, Duke Nukem has you walking down city streets, entering realistic locales like supermarkets and football stadiums, and blasting aliens all the while with a plethora of clever weapons. From pipe bombs to "freeze throwers" to laser-activated mines to machine guns. Other inventive powerups include jetpacks, portable medkits and speed/melee damage boosting steroids. It's still steeped in brutal violence, cheesecake and cheesy action movie one-liners, of course, but that's all part of the charm. While technically a sequel, Super Metroid also serves as something of a remake, taking the design of the original Metroid and expanding on it tenfold. 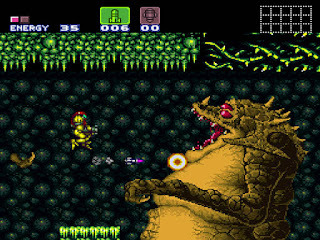 This comes in the form of a larger game environment, yes, but it also extends to the overall design, with numerous new powerups, countless new abilities for Samus (including the ever-popular Shinespark and wall-jump) and colossal boss battles that really showed off the power of the Super Nintendo platform. All accompanied by the same moody score and bizarre alien environments of the original, as well as a captivating storyline despite lacking much of a spoken narrative. Super Metroid is still the gold standard for the genre even twenty years after its release. Easily my favorite Sega game of all time, as well as one of the finest JRPGs ever released to this day, Phantasy Star IV certainly went all-out to prove that the Sega Genesis could hold its own against its competitor. Not only for its great visual design and an outstanding soundtrack that perfectly highlights the game's science fantasy setting, but for its strong gameplay. Utilizing a macro system that streamlines random encounters and allows players to combine many spell effects together for greater effect (over a year before Chrono Trigger, no less*), there was a lot more on offer here than the complex maze-walking its predecessors provided. But the real kicker is the narrative, which utilized manga panel styled cutscenes to advance its story in a unique way for its era and a narrative that provided for some strong characters and a perfect wrap-up to the series' running storyline. A definite must-play for RPG fans. * Both games came out in North America in 1995; However, Phantasy Star IV debuted in Japan in December 1993 while Chrono Trigger's Japanese release was in March of 1995. So my statement is correct! The final game worked on by Looking Glass, and quite a solid one to go out on. System Shock 2 is a brilliant blend of survival horror, RPG and first person shooter elements, giving the player almost total freedom in the way they customize their character and play through the game. The horror element is also amazingly well realized, conveying a feel of claustrophobia and isolation thanks to its uncomfortable setting and the ever-present menace of the Many, a hive-mind of creepy parasitic aliens that has the ship firmly in its possession. Not to mention some unparalleled audio design and voice acting, as was Looking Glass' trademark. 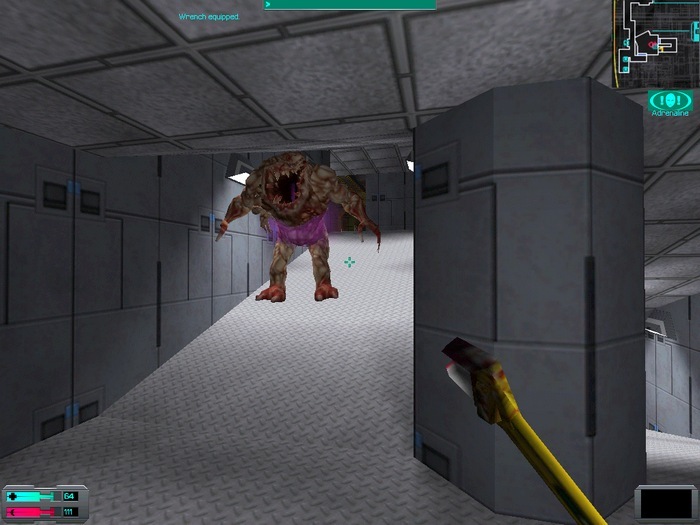 A game with tons of replayability and fantastic atmosphere, System Shock 2 is easily my favorite horror game of all time. Quintet is pretty much the definitive cult classic company from the Super Nintendo era, creating numerous titles that dared to tell stories driven by emotion and atmosphere in an era where games were still largely viewed as "fun diversions" more than anything. 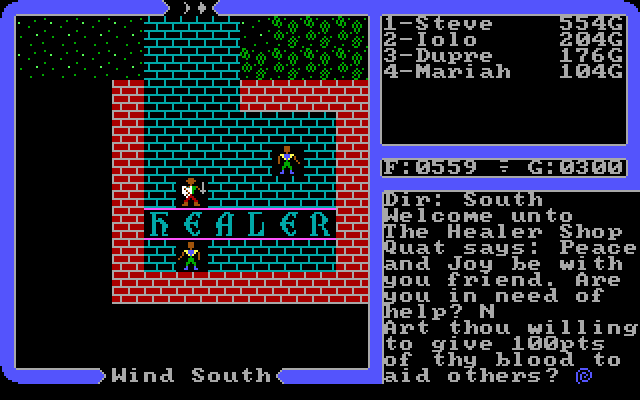 They got their start with the angelic-themed games Soulblazer and Actraiser, which had the player rebuilding the world after a catastrophe. Illusion of Gaia still carries on that theme, but now places a lot more emphasis on the narrative as well, with some well-developed characters and dialog turning what would otherwise be a fairly average adventure into a truly memorable experience. Of course, they didn't skimp on the game's design either, combining Zelda-styled puzzles with some surprisingly challenging boss battles, well-designed locales and clever mechanics throughout. And of course, no mention of Quintet can go without mentioning their soundtracks; absolutely incredible orchestral tracks that sound too good to be coming out of a system without CD audio. It may be largely forgotten today, but Illusion of Gaia remains one of my all-time favorites. A remake of the cult classic Sega CD RPG, and what a fine remake it is, introducing updated visuals and music as well as some surprisingly good voice acting, animated cutscenes and song numbers on par with a big budget Disney film. Further helping matters is its well-defined cast of characters, who shine with personality and have quite a lot of funny banter with one another, adding a lot to the game's charm (and yes, this even includes the game's villains). While Lunar may be an archetypal and even somewhat cliched game at its core, that really doesn't matter much when it's so well executed that you don't mind playing it again and again regardless. 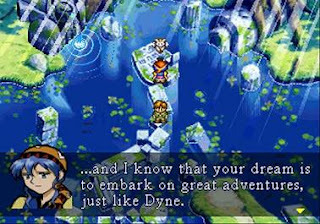 To me, Lunar will always be synonymous with quality old-school RPGs. 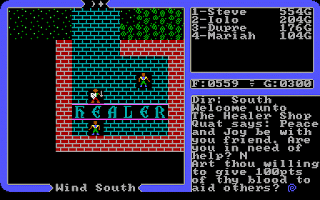 Doubtlessly one of the most important RPGs ever made, Ultima IV is not about simply defeating some great evil; you already did that three times in the previous games. Rather, you now take up the role of a different sort of hero entirely - leading by example, helping the needy and asking for nothing in return. To that end you must master the eight virtues (Compassion, Honesty, Valor, Honor, Justice, Sacrifice, Spirituality and Humility) and begin a quest into the Stygian Abyss itself to recover the Codex of Ultimate Wisdom alongside the champions of the land. Of course, it's not as simple as it sounds - you'll have to uncover a long trail of clues by travelling between towns, searching around and cross-referencing everything people say to find everything you'll need to complete the journey, and that can easily eat up many hours in itself. Still, the unique premise, intricately detailed world and compelling lore of Britannia all make it a very worthwhile journey. From the gaming legend Hideki Kamiya, who brought us such over-the-top action titles as Resident Evil 2, Viewtiful Joe and the original Devil May Cry, comes a game whose wild, stylized action puts all of his previous efforts to shame and still has plenty of awesomeness left over. 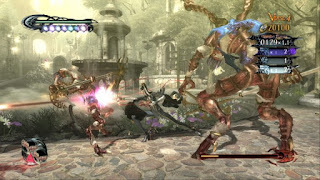 In addition to the usual puzzle-solving and melees with huge swarms of foes, Bayonetta's gameplay is also a wonderfully spot-on mix of styles from seemingly every action game of the 3D era, allowing the player to wield swords, whips, fire and and lightning claws, or just a plethora of firearms (all of which can be used to extend weapon combos by holding down the button after a strike). All presented in colorful, gorgeous 60 FPS and with an incredibly funny protagonist to boot. Bayonetta is doubtlessly one of the finest action games ever made, if not the best. Fallout was one of Black Isle's big hits in the late 90s, so many fans were disappointed when the IP fell to Bethesda and became more of a futuristic Elder Scrolls than anything. 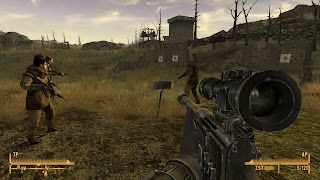 New Vegas saw the original writers return, however, crafting a sprawling world more in line with the series norm while still utilizing Fallout 3's engine. The end result is what one would expect from Obsidian - well written, complex, and with a ton of content (and much more planned, as evidenced by mountains of unused content in its code). Of course, the limitations of the engine also become much more evident here, with many bizarre bugs throughout even after several patches. Still, the game is such a deep and engrossing experience that you really don't mind them too much, and the sheer number of fan mods out there lends it some tremendous replay value as well. Not to mention some very high-quality downloadable content missions that add a lot to the overall game, retaining the same sharp sense of humor and strong writing Obsidian is known for. New Vegas may not be a perfect game, but it's an immensely enjoyable one that can easily captivate you for months. 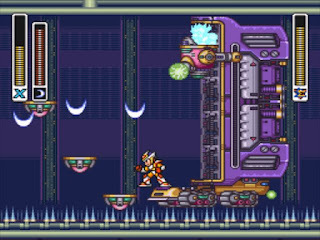 Mega Man X2 is another example of the first game in the series introducing plenty of new elements, but the second one coming along and pushing them to perfection. 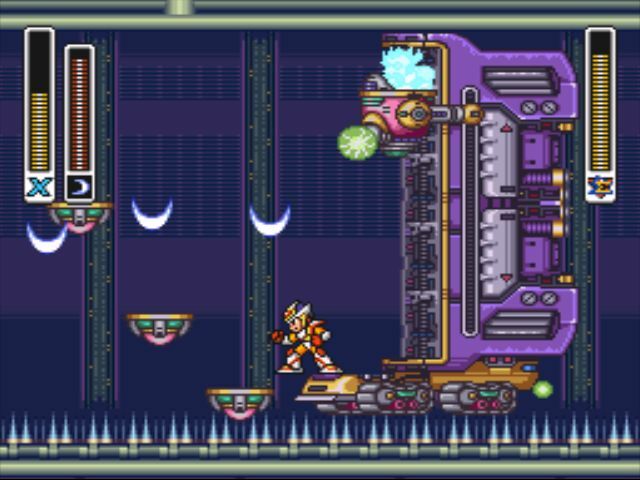 Mega Man X2 is just that, pushing its stage design, visuals and music to new heights while retaining the same basic feel and format of the original Mega Man X. Of cours,e they also introduced some new elmeents to the game in the form of some clever upgrades (with the armor in particular allowing for a screen-sweeper attack once enough damage is sustained) and some new nemises in the form of the "X Hunters", who enable an alternate story branch if all three are defeated before the final fortress.